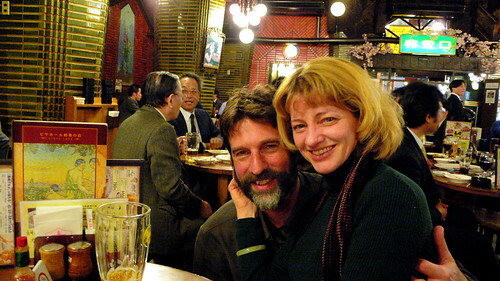 On Friday, March 31 — the day before Tomo’s wedding — I took the train up to Tokyo, checked into the Shinagawa Prince hotel, and then headed for the Tokyo International Forum to meet Mary and Scott for some drinking, some dinner, and some more drinking too. And also some architecture. 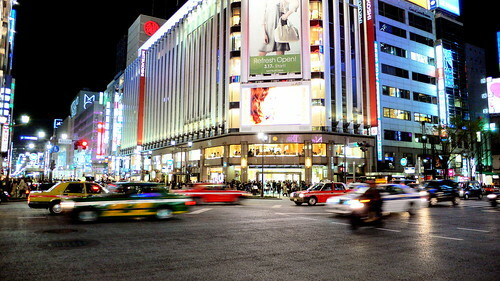 The first stop was the Forum itself, which is located right next to Yurakucho station. The Glass Hall of the Tokyo Forum is an incredible open space within the main structure of the building that really destroys the classic sense of interior/exterior — especially because the ceiling of the hall looks like nothing so much as the hull of a ship as seen from below the surface of the water. In the Glass Hall, you are at once inside, outside, and underneath. Being inside the Glass Hall gives you the strange sense that you could almost levitate to any point within the space of the hall itself, though I suppose this is due to the alarming sense of openness that the hall is able to produce — quite startling when contrasted with the closed-in microspaces of the rest of Tokyo. After meeting at the Forum we took the train to Ginza where we walked down the street commenting on buildings up until the point where we actually walked into one. The Ginza Lion serves dinner and beer in the classic Hofbräu style (sausages, pickled herring, the gamut) and the building itself, or at least the section of the building that we were in, was designed by a student of Frank Lloyd Wright, and it definitely has that feeling of completely integrated space that is the hallmark of so much of Wright’s work. The building is clad in gorgeous deep-green tile and has a bit of an Art Deco feel about it (especially the tile mural which depicts the harvesting of grain), which makes sense since it was built in 1934. Of premier importance, however, is the fact that the large-sized mugs are truly enormous (they put the ‘dai’ in ‘dai’), and the food is really good too. So you can eat and drink and have your architectural pleasure all at one. Of course, no bout of architecture drinking is complete without a trip to Frank Lloyd Wright’s Imperial Hotel, or at least what’s left of it. Although it was able to withstand The Great Kanto Earthquake of 1923, apparently it couldn’t withstand the rigors of redevelopment, and in 1976 it was moved from its original location to the Museum Meiji-Mura, located outside of Nagoya. However, they weren’t completely idiotic about it and they left the most important piece of the hotel in place — the bar. Located on the third floor (if I remember correctly) the bar is a classic combination of dark wood and Wrightian geometries. Of course there is also a ubiquity of glasswork and furnishings designed by Wright, and expensive scotch too (of which we partook). And then we ended up drinking a lot and then we ended up talking about the aesthetics and ethics of eating live food, which you can do in Japan (if you care to). I personally have no desire to have a fish looking at me with its accusative eye while I harvest the tasty morsel located just below its dorsal fin, but I suppose someone must enjoy the effect. 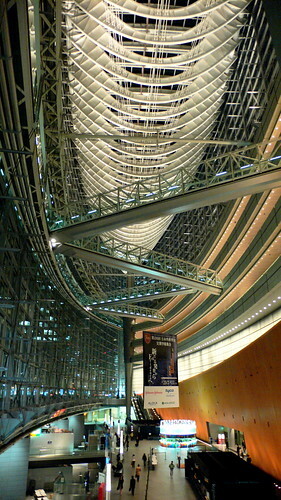 Inside the Tokyo Forum, below the ribbed hull of the ship/ceiling. If you look closely you can see tiny people walking around like scuttling claws on the ocean’s floor. 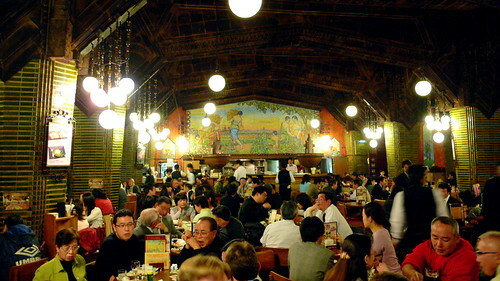 Inside the Ginza Lion. If you look straight back you can see the idyllic image of women harvesting armloads of golden grain. In fact, farming never looked better. 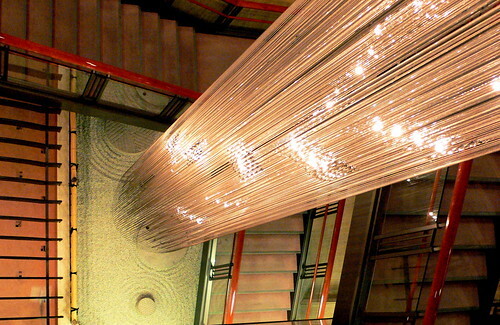 I don’t think Frank Lloyd Wright had anything to do with this light, but it was a commanding presence on the way to the Imperial Hotel bar. Unfortunately the bar itself was a bit too dim for proper picture taking. Next: tomo and mariko get married!